The cold bar is an option more cafeterias are opting for. This gives the opportunity to offer things like fresh fruit as well as the ability to offer a salad bar. This is a healthy alternative that makes people feel better about what they are eating. The issue that many cafeterias have is maintaining all of the food at the right temperatures. The good news is that there are several pieces of equipment that will make it easy for you to maintain the temperature of your food items on the cold bar. You can either use an old-fashioned crushed ice method or you can purchase a refrigerated salad bar. Either way, you will be able to keep all of your food below 40 degrees and maintain happy guests. If you are going to use crushed ice to keep everything cold, you will need to make sure that you have a drainage option to get rid of all the water that melts from the ice. If it is a small enough bar, you can even get away with using a bucket under the drainage point for the salad bar. The main trench for the salad bar should be filled with plenty of crushed ice to only leave enough room for you to put in the pans or bowls of food. 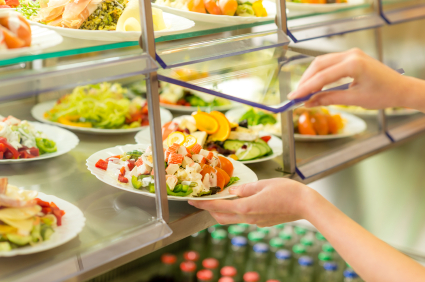 Make sure that the crushed ice does not go into the salad bar until you are ready to put the food in, so it will have the least amount of exposure to the air as possible. When filling in the ice, make indentions for all your pans and pack it in tight. The more packed in the crushed ice is, the slower it will melt. Make sure that as you are changing out the items in the salad bar that you are checking the ice levels. If the ice is melting, you might need to add some more. Having ice buckets ready to transport crushed ice makes it possible for you to maintain the temperatures of the food you are serving even easier. If you do not want to mess with all of the ice, you can simply purchase a refrigerated salad bar. You will pay more for the convenience of having a refrigerated unit, but when using it, you will only need to set the temperature you want to keep everything at and the condenser will take care of the rest. When placing food items into the salad bar, make sure that you are not leaving any room in between the pans. If you leave any room for the cold air to escape, you will not be able to maintain the temperatures properly. Always try to use metal pans rather than plastic. It will allow you to transfer the cold better and keep your food even colder. The main drawback to a refrigerated unit is the price. Not only will this cost you more when you initially purchase the salad bar, but you will need to worry about maintenance and upkeep. There is always the possibility that the refrigerating unit will break down. Even if the unit does not break down, you should invest in a maintenance schedule to prevent it breaking down. No matter which of the two options you go with, make sure that you are checking the temperatures of your food constantly. If you notice there is a problem with maintaining a temperature below 40 degrees, you will need to take immediate action. Your diligence will pay off with happier guests that will keep coming back for more.